In what is being considered a partial success by forest rights activists, following the tribals' six months long campaign, half a dozen gram sabhas of Kalahandi district have "forced" the Odisha Forest Department to issue a special circular allowing them to sell kendu leaf (KL) to anyone whom they want as per the Forest Rights Act (FRA), 2006. Even as allowing them to do business on their own, the November 17 notification, issued by the Forest Department, say senior activists, is not clear whether the six gram sabhas can sell their KL stored in their houses collected in May 2017, as Paragraph-7 of the notification talks of the year 2018. Further, the notification is restricted to six gram sabhas only and wants to restrict the KL collection area involving Forest Range Officer in enumeration of the KL to be collected and sold. Seeking "immediate revision of the notification", the Odisha chapter of Campaign for Survival and Dignity (CSD), which mobilized the tribals and forest dwellers across the country for the enactment of FRA, has said, there is utter confusion on implementing it. “While the Bhawanipatna Kendu Leaf DFO says that the six gram sabhas cannot sell their KL stored in the houses, Suresh Chandra Mohapatra, Principal Secretary, Forest & Environment Department, Odisha government, says that they can", it noted. 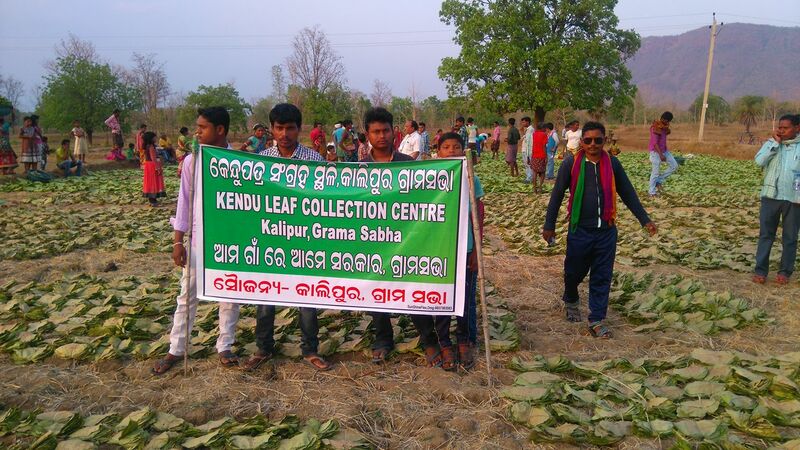 In the last kendu leaf season in May 2017, the gram sabhas of Khainsuguda, Jamugudabahal, Jamjharan, Kasturpadar, Kanakpur, and Kalipur in Kalahandi district coming under Bhawanipatna KL division gathered kendu leaves and decided to take up KL business in their hands, exercising ownership rights recognized under Section 3(1) (c) of Forest Rights Act (FRA), 2006. They did a business agreement with a Maharashtra merchant and committed to supply 72,000 bundle of KL at Rs 7.50 per bundle (60 leaves) against Rs 2.40 paid by the Odisha government. Accordingly, the merchant paid Rs 3,64,000 as advance out of Rs 5,40,000 payable to the villagers. However, after knowing the development, the local Forest Department officials obstructed them and threatened the KL businessman. Since then the community people of the six villages were struggling to sell their KL and get justice. They filed petitions before the District Collector, the Forest Department, the FRA State Level Monitoring Committee (SLMC), and even approached the Ministry of Tribal Affairs, Government of India. Jual Oram, Minister of Tribal Affairs, Government of India, on July 3 wrote to Navin Patnaik, Odisha chief minister, to address the issue of the six gram sabhas. Even the Scheduled Caste/Scheduled Tribe Development Department, Odisha government, reminded the Forest Department on July 22 that the latter had violated FRA by obstructing gram sabhas and asked it to allow them to do KL business independently. The leaders of the six gram sabhas met and appraised their plight to Ramesh Chandra Majhi, Odisha SC/ST Development Minister, but he also failed to resolve the issue. "In between the Forest Department continued to threaten the community people, activists and civil society organization involved in the process”, CSD said, even as joining a protest rally held in Bhubneswar on June 28. On August 13, 2017 it wrote a letter to Naveen Patnaik urging him to allow the six gram sabhas to exercise their ownership rights over KL. “Since the Forest Department is responsible for the damage of the kendu leaves of the six gram sabhas of Kalahandi district, we demand that the Odisha development government should immediately pay Rs 5,40,000 excluding all expenditures incurred towards storage and maintenance of KL to the six gram sabhas”, CSD said.